A Lake District walk, in the words of William Wordsworth, “the loveliest spot that man hath found”. The Lakes form the largest National Park in England, and have inspired some of Britain’s best authors, including Beatrix Potter – author of “The Tale of Peter Rabbit”. Visiting the Lake District is popular for a short getaway, but it is hard to know where is best to visit. There is the Beatrix Potter Museum, Cartmel Racecourse, the Lakeside Steam Railway, Lakes aquarium and Penrith castle to name a few. But no visit to the Lakes would be complete without a walk or cycle to ‘soak’ (pardon the pun!) up the beautiful views. We’ve found five of the best Lake District walk and cycling routes to help make the most of your visit, including a wild swimming route for the braver explorer! If you have a favourite walk, cycle, ride or swim in the Lake District then do comment below and let us know. Found in the heart of the Lake District Sprinkling Tarn is a quiet and secluded setting. The tranquil surroundings are far away from the crowds, allowing you to relax and enjoy a true ‘wilderness experience’. Starting at Seathwaite this 3 mile route takes you upstream, following the fell to Sprinkling Tarn. 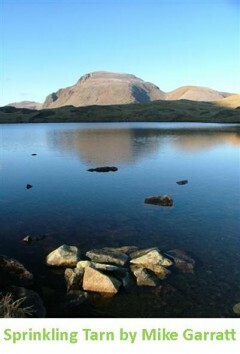 The spectacular lake is surrounded by mountains, including Scarfell Pike – the highest mountain in England. The pristine water and stunning location also make this a popular location for wild camping. For more information on Wild Swimming’s Sprinkling Tarn adventure click here. And if you want to try the swimming, you may want to wait for summertime. Coniston Water is the third largest lake in the Lake District and inspired Arthur Ransome’s children’s novel Swallows and Amazons. This walk is perfect to keep younger members of the family amused, while keener walkers tackle nearby Coniston Old Man – on a clear day you can see Blackpool Tower from the summit! The Cumbria Tourist Board’s three mile walk along the shore of Coniston Water is a mixture of paths and tracks, weaving in and out of the trees, never straying out of sight of the lake. Along the way there are plenty of spots perfect for a picnic and an opportunity to see the beautiful sights. 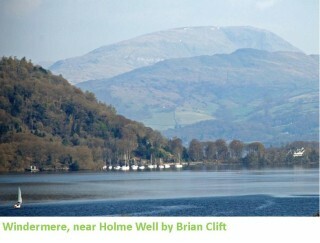 For more information on the Cumbrian Tourist Board’s walking route click here. To maintain the beauty of the Lake District for future generations, conservation is essential. 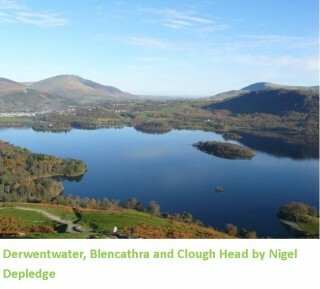 Bassenthwaite Reflections is a lottery funded programme, designed to protect the landscape of the local area. Their walking route from Honister to Keswick takes in the picturesque Derwent Water, as well as the Folly Bridge, built in 1781 and complete with lime stalactites formed from lime deposits in rainwater over the last 200 years. For more information on Bassenthwaite Reflections’ walking route, also awarded the ‘Most Creative ViewRanger Route’ in 2010, click here. You might not associate the Lake District with coastline, but the west coast has some beautiful beaches, which are much more peaceful than those in popular destinations such as Blackpool and Brighton. CycleCity Guides’ easy cycle route takes in this fantastic coastline and passes by red sandstone cliffs as well as some fine views of the Lakeland fells. There are plenty of opportunities for refreshments on the eight mile, traffic-free ride, particularly at Workington and Whitehaven. For more information on CycleCity Guides’ cycling route click here. Undoubtedly, a visit to Lake Windermere is the pinnacle of any Lake District holiday. The ferry from Bowness-on-Windermere gives you an opportunity to get out on the lake, but if you are feeling more adventurous there are rowing boats to hire too. If you are a keen cycler and want to see the best of the Lake District all at once, Cordee Publishing’s 18 mile cycling route is for you. Starting in Backbarrow, the route climbs into the village of Cartmel, famous for their multi award-winning Sticky Toffee Pudding, then along the top of the Winster valley, into Windermere to catch the Ferry over to the west side of Lake Windermere, where you return to Backbarrow along the Rusland Valley. For more information on Cordee Publishing’s cycle route click here.